Planning approval in Wilmslow creates a valuable site. CEC grants outline Planning approval. So a garden is now a prime site. It’s near the High School in Wilmslow. The new address is on Broadway. Beside my clients’ home. The planning approval reserves only appearance. Therefore the planning approval fixes most design elements. A list of them is as follows. Use, layout, landscape design and scale. So the garden’s higher value is secure. The planning approval fixes size. Consequently a developer’s financial appraisal is easy to calculate. The outline planning approval is key to bringing this Wilmslow site to market. There is now a new four bedroom house for sale. I manage planning approval processes carefully. Consequently the Council usually gives planning approval to my applications. In turn this is crucial to that “for sale” sign. Risk of overlooking is a key issue. Failure to design for overlooking means no planning approval. So I create a balanced design. This maintains views out of the house. It maximises natural lighting. But it preserves privacy for neighbours. My design has simple circulation. It also has regular room shapes. Light will beam into the house because of interior glazing and a transparent stairway. I preserve privacy with novel design. An example is the upper balcony window. It has no lateral view. But you can still see out of it over the garden. 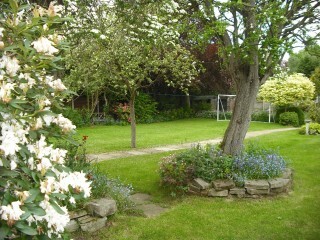 The planning approval must keep the existing garden. Step onto its sunny lawn directly through sliding folding doors. These open from a big multi-function space. The master bedroom is overhead. So it also has panoramic garden views. It also has an ensuite and dressing room. A careful survey under-pins the design concept. An appraisal of the existing street scene also informs the concept. Therefore the design fits in well. The best examples of why are its massing and height. Fine tuning like this is critical to planning approval. The Wilmslow planning officer wants such balance in design. My contemporary architecture serves a purpose. This is to get outline planning approval. But I word the application very carefully. As a result the type of architecture is flexible. Therefore the type of architecture can be changed in the second planning approval. This is often done to appeal to a wide market. But it means the house built, which is designed by others, is a pastiche. Its plan is overly complex compared to the outline design. But site value has been preserved. And the house will probably sell easily. Because buyers are usually more concerned about location than looks. Both designs have played their parts in achieving a sale.